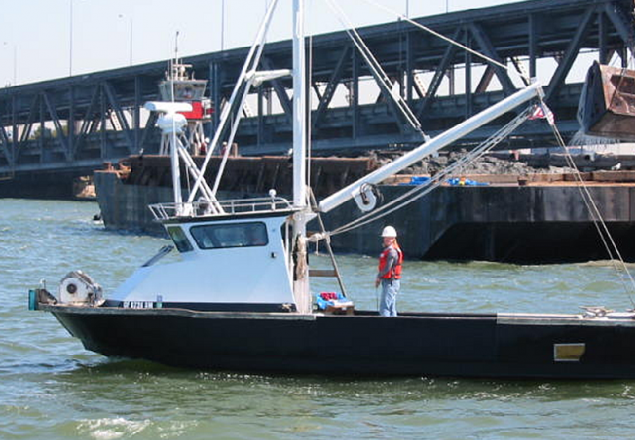 San Francisco Bay Bridge Environmental Monitoring | Sea Engineering, Inc. In 2002, the California Department of Transportation (Caltrans) and the Bay Area Toll Authority (BATA) joined forces to begin the replacement of the east span of the San Francisco-Oaklnad Bay Bridge. The project involves the building of a new seismically stable span and the removal of the older, seismically vulnerable structure. Sea Engineering is currently providing water quality, turbidity, and QA/QC dredge monitoring services to Caltrans in support of the access dredging and construction of the new footings. Under the Waste Discharge Requirements (WDRs) for the East Span Project, Caltrans is required to conduct turbidity monitoring and reporting activities according to a Self-Monitoring Program (SMP) during dredging and fill activities (California Regional Water Quality Control Board Order R2-2002-0011). Caltrans is required to prevent increases of turbidity and chemicals of concern in amounts greater than those specified in the WDRs to protect eelgrass beds located adjacent to the project area that have been designated as an Environmentally Sensitive Area (ESA). Sea Engineering, Inc. is providing monitoring, documentation, and reports related to compliance with discharge specifications and receiving water limitations established by the California Regional Water Quality Control Board (RWQCB). SEI Field engineers and project managers are working closely with Caltrans program managers, contract dredge engineers, and construction engineering staff to develop monitoring protocols and adaptive monitoring techniques to ensure that the client is able to maintain compliance with agency regulations.